This coming Saturday – October 21st – the Vancouver Robotics Club will host its annual Robot Games event where we invite all robot builders to come out and show off their creations. This year’s event will be held at BCIT, in Building SW2, Room “Town Square D.” The fun starts at 11am and will run until approximately 4pm, with breaks for lunch and robot repairs and such. Events include line following, robotic sumo wrestling (Lego and two classes of autonomous minisumo), a walking & crawling robot triathlon, solar speeder races, and photovore competitions. Promises to be a lot of fun for everyone. The new hockey season is well under way, promising many exciting games. We attended the Canucks home opener against the San Jose Sharks last Friday night. The score sounded much worse than it was (we lost 4 – 6) but it was an exciting show right up to the end. The team is quite different this year, only nine players continue from last season. And much of the team comes up from the Manitoba Moose, same as the new coach Alain Vigneault. It’s like we have an AHL team playing in the NHL, and boy did they look like it on Friday night – the Sharks ran circles around them. Fortunately there are seventy-plus games to go, and they didn’t look that bad on Friday. Tomorrow night is another home game, this time against Edmonton. Should be fun to watch, especially if they pull it together and play like the same team that played smart and fast hockey to open the season with a win in Detroit. Why? Why does it always happen to the best ones? I just found out that the television program Smith was cancelled last Friday. I was looking for it on the guide, I was expecting it to be on later tonight on CTV. I couldn’t find it, so I went to the CTV website but there is absolutely no references to be found. The CBS website is far enough behind that they are still talking about last week’s episode. A search on Google turned up the Wikipedia link so I visited it, and found out the news. Sure, episode two wasn’t as good as episode one, but episode three was really fantastic and both Eileen and I were eagerly anticipating tonight’s episode. Comments Off on Why? Why does it always happen to the best ones? I just uploaded a bunch of pictures from Robothon, figured I’d get them up and spend some time annotating them later. There were some really impressive robots to see this year and everyone had a great time. Dave Hylands has some video from the Line Maze event. You can see my robot Hyperion run through its three attempts. Watch some of the other ones too, some are very impressive. 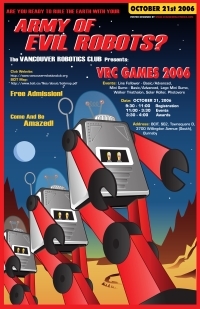 On a related note, the Vancouver Robotics Club will hold its annual event on October 21st. Details available on our website. Success! The Thin Man Works! Just got back home from Robothon where I competed in two events with three robots: Line Maze with Hyperion, and Mini Sumo with Velox and The Thin Man (TTM). Similar to last year, my attempt at the Line Maze was a bit of a disaster. This wasn’t surprising. I made a half-hearted attempt to figure out what might be wrong, but honestly didn’t spend nearly enough time on it. Oh well. The up side: Velox won second place and TTM took third place in the Advanced Mini Sumo event. Dave Hylands won first place (as usual, drat) but TTM worked pretty well and was very promising despite its “limitations”. You have to understand that I procrastinated through the summer, finally finished the machining and electronics on Friday morning, wrote just enough code to get some simple behavior on Saturday, and competed on Sunday. I got many great comments on the design. Everyone was very impressed with how nice it turned out. It was so thin that no other robot could actually detect it unless it was really close. Unfortunately TTM was also completely blind (no idea why, yet) so often it was a bit of comic relief watching two blind robots spin around each other. I figured winning a match or two would be a great success but third place (especially against some really good robots) is well beyond my expectations. As usual, Robothon was a lot of fun and I got to catch up with many people I don’t see very often, including the Spark Fun guys Nathan and Ben, and the nice folks from Pololu too. I’ll try to get my photos online in the next couple of days.